Caffeic acid is an hydroxycinnamic acid. This yellow solid consists of both phenolic and acrylic functional groups. It is found in all plants because it is a key intermediate in the biosynthesis of lignin, one of the principal components of plant biomass and its residues. Caffeic acid can be found in the bark of Eucalyptus globulus. It can also be found in the freshwater fern Salvinia molesta or in the mushroom Phellinus linteus. Caffeic acid is found at a very modest level in coffee, at 0.03 mg per 100 ml. It is one of the main natural phenols in argan oil. It is found at high level in some herbs, especially thyme, sage and spearmint (at about 20 mg per 100 grams), at high levels in spices, especially Ceylon cinnamon and star anise (at about 22 mg per 100 grams), found at fairly high level in sunflower seeds (8 mg per 100 grams), and at modest levels in red wine (1.88 mg per 100 ml) and in applesauce, apricot and plum prunes (at about 1 mg per 100 grams). It is at super high level in black chokecherry (141 mg per 100 grams) and in fairly high level in ligonberry (6 mg per 100 grams). It is also found in barley grain. and in rye grain. 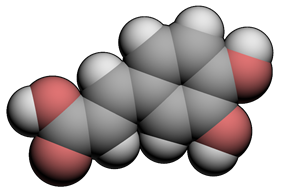 Caffeic acid, which is unrelated to caffeine, is biosynthesized by hydroxylation of coumaroyl ester of quinic acid (esterified through a side chain alcohol). This hydroxylation produces the caffeic acid ester of shikimic acid, which converts to chlorogenic acid. It is the precursor to ferulic acid, coniferyl alcohol, and sinapyl alcohol, all of which are significant building blocks in lignin. The transformation to ferulic acid is catalyzed by the enzyme caffeic acid-O-methyltransferase. Caffeic acid and its derivative caffeic acid phenethyl ester (CAPE) are produced in many kinds of plants. In plants, caffeic acid (middle) is formed from 4-hydroxycinnamic acid (left) and is transformed to ferulic acid. Caffeate O-methyltransferase is an enzyme responsible for the transformation of caffeic acid into ferulic acid. Caffeic acid and related o-diphenols are rapidly oxidized by o-diphenol oxidases in tissue extracts. Caffeate 3,4-dioxygenase is an enzyme that uses caffeic acid and oxygen to produce 3-(2-carboxyethenyl)-cis,cis-muconate. 3-O-caffeoylshikimic acid (dactylifric acid) and its isomers, are enzymic browning substrates found in dates (Phoenix dactylifera fruits). Caffeic acid has a variety of potential pharmacological effects in in vitro studies and in animal models, and inhibitory effect of caffeic acid on cancer cell proliferation by oxidative mechanism in human HT-1080 fibrosarcoma cell line has recently been established. Caffeic acid is an antioxidant in vitro and also in vivo. Caffeic acid also shows immunomodulatory and anti-inflammatory activity. 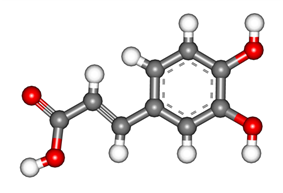 Caffeic acid outperformed the other antioxidants, reducing aflatoxin production by more than 95 percent. The studies are the first to show that oxidative stress that would otherwise trigger or enhance Aspergillus flavus aflatoxin production can be stymied by caffeic acid. This opens the door to using natural fungicide methods by supplementing trees with antioxidants. Studies of the carcinogenicity of caffeic acid have mixed results. Some studies have shown that it inhibits carcinogenesis, and other experiments show carcinogenic effects. Oral administration of high doses of caffeic acid in rats has caused stomach papillomas. In the same study, high doses of combined antioxidants, including caffeic acid, showed a significant decrease in growth of colon tumors in those same rats. No significant effect was noted otherwise. Caffeic acid is listed under some Hazard Data sheets as a potential carcinogen, as has been listed by the International Agency for Research on Cancer as a Group 2B carcinogen ("possibly carcinogenic to humans"). More recent data show that bacteria in the rats' guts may alter the formation of metabolites of caffeic acid. There have been no known ill-effects of caffeic acid in humans. Caffeic acid is susceptible to autoxidation. Glutathione and thiol compounds (cysteine, thioglycolic acid or thiocresol) or ascorbic acid have a protective effect on browning and disappearance of caffeic acid. This browning is due to the conversion of o-diphenols into reactive o-quinones. Chemical oxidation of caffeic acid in acidic conditions using sodium periodate leads to the formation of dimers with a furan structure (isomers of 2,5-(3′,4′-dihydroxyphenyl)tetrahydrofuran 3,4-dicarboxylic acid). Caffeic acid can also be polymerized using the horseradish peroxidase/H2O2 oxidizing system. Caffeic acid may be the active ingredient in caffenol, a do-it-yourself black-and-white photographic developer made from instant coffee. The developing chemistry is similar to that of catechol or pyrogallol. It is also used as a matrix in MALDI mass spectrometry analyses. ^ Kevin S. Gould, Kenneth R. Markham, Richard H. Smith and Jessica J. Goris, (2000). "Functional role of anthocyanins in the leaves of Quintinia serrata A. Cunn.". Journal of Experimental Botany 51 (347): 1107–1115. ^ a b Boerjan, Wout; Ralph, John; Baucher, Marie (2003). "Ligninbiosynthesis". Annual Review of Plant Biology 54: 519–46. .
^ Santos, Sónia A. O.; Freire, Carmen S. R.; Domingues, M. Rosário M.; Silvestre, Armando J. D.; Pascoal Neto, Carlos Pascoal (2011). "Characterization of Phenolic Components in Polar Extracts of Eucalyptus globulus Labill. Bark by High-Performance Liquid Chromatography–Mass Spectrometry". Journal of Agricultural and Food Chemistry 59 (17): 9386–93. ^ Choudhary, M. Iqbal; Naheed, Nadra; Abbaskhan, Ahmed; Musharraf, Syed Ghulam; Siddiqui, Hina; Atta-Ur-Rahman (2008). "Phenolic and other constituents of fresh water fern Salvinia molesta". Phytochemistry 69 (4): 1018–23. ^ Lee YS; Kang YH; Jung JY; et al. (October 2008). "Phellinus linteus"Protein glycation inhibitors from the fruiting body of . Biological & Pharmaceutical Bulletin 31 (10): 1968–72. ^ ., Z. Charrouf; ., D. Guillaume (2007). "Phenols and Polyphenols from Argania spinosa". American Journal of Food Technology 2 (7): 679–683. ^ Quinde-Axtell, Zory; Baik, Byung-Kee (2006). "Phenolic Compounds of Barley Grain and Their Implication in Food Product Discoloration". J. Agric. Food Chem. 54 (26): 9978–9984. ^ a b Olthof MR, Hollman PC, Katan MB; Hollman; Katan (January 2001). "Chlorogenic acid and caffeic acid are absorbed in humans". J. Nutr. 131 (1): 66–71. ^ Pierpoint, W. S. (1969). "o-Quinones formed in plant extracts. Their reactions with amino acids and peptides". Biochem. J. 112: 609–616. ^ Maier, VP; Metzler, DM; Huber, AF (1964). "3-O-Caffeoylshikimic acid (dactylifric acid) and its isomers, a new class of enzymic browning substrates". Biochemical and Biophysical Research Communications 14: 124–8. ^ Rajendra Prasad, N; Karthikeyan, A; Karthikeyan, S; Reddy, BV (Mar 2011). "Inhibitory effect of caffeic acid on cancer cell proliferation by oxidative mechanism in human HT-1080 fibrosarcoma cell line". Mol Cell Biochem 349 (1-2): 11–9. ^ "Nuts’New Aflatoxin Fighter: Caffeic Acid?". ^ a b M Hirose, Y Takesada, H Tanaka, S Tamano, T Kato and T Shirai (1998). "Carcinogenicity of antioxidants BHA, caffeic acid, sesamol, 4- methoxyphenol and catechol at low doses, either alone or in combination, and modulation of their effects in a rat medium-term multi-organ carcinogenesis model" (PDF). Carcinogenesis 19 (1): 207–212. ^ "Caffeic Acid (IARC Summary & Evaluation, Volume 56, 1993)". ^ MA Peppercorn and P Goldman (1972). "Caffeic acid metabolism by gnotobiotic rats and their intestinal bacteria". Proceedings of the National Academy of Sciences 69 (6): 1413–1415. ^ M-P Gonthier, M-A Verny, C Besson, C Rémésy and A Scalbert (1 June 2003). "Chlorogenic acid bioavailability largely depends on its metabolism by the gut microflora in rats". Journal of Nutrition 133 (6): 1853–1859. ^ Cilliers, Johannes J. L.; Singleton, Vernon L. (1990). "Caffeic acid autoxidation and the effects of thiols". J. Agric. Food Chem. 38 (9): 1789–1796. ^ Fulcrand, Hélène; Cheminat, Annie; Brouillard, Raymond; Cheynier, Véronique (1994). "Characterization of compounds obtained by chemical oxidation of caffeic acid in acidic conditions". Phytochemistry 35 (2): 499–505. ^ Xu, Peng; Uyama, Hiroshi; Whitten, James E.; Kobayashi, Shiro; Kaplan, David L. (2005). "Peroxidase-Catalyzed in Situ Polymerization of Surface Orientated Caffeic Acid". J. Am. Chem. Soc. 127 (33): 11745–11753. ^ Caffenol blog "Caffenol-C-M, recipe"
^ Beavis RC, Chait BT; Chait (December 1989). "Cinnamic acid derivatives as matrices for ultraviolet laser desorption mass spectrometry of proteins". Rapid Commun. Mass Spectrom. 3 (12): 432–5.